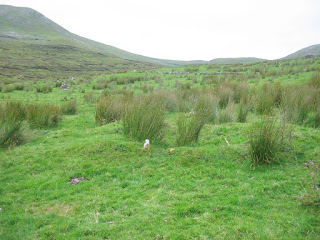 The Standing Stone: Guest Post: "The Archaeological Landscape of Leean Mountain, Co. Leitrim" by Thorsten Kahlert and Tatjana Kytmannow. Guest Post: "The Archaeological Landscape of Leean Mountain, Co. Leitrim" by Thorsten Kahlert and Tatjana Kytmannow. A multi-seasonal landscape project, ‘Leean in Context’ (Kytmannow et al. 2009) uncovered a complex and vast prehistoric landscape embedded in a Early to Post Medieval pastoral landscape. 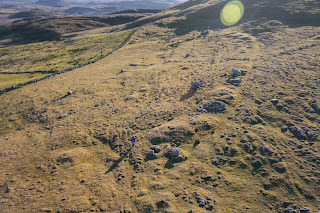 Only three megalithic structures, one cairn, one large enclosure and one hut site were listed by the RMP prior to the project. Since the first field season 2003 over 50 sites were recorded by Kytmannow et al. (2008a, 2009). 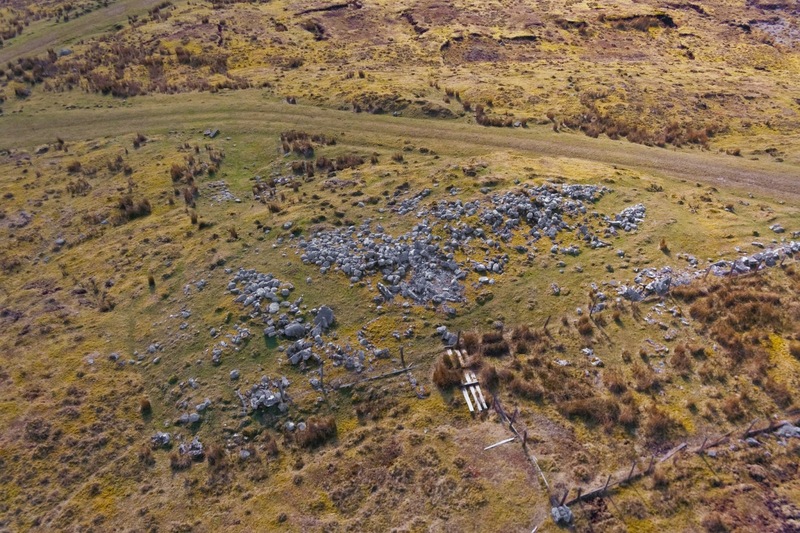 Hut sites, occurring as isolated sites and in clusters, are by far the most common site type at Leean, followed by pre-bog walls, cairns, megalithic monuments, boulders and standing stones. 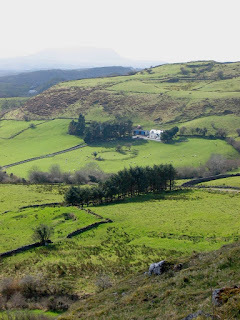 Leean Mountain is the easternmost part of the Dartry Mountains in northwest County Leitrim, bordering Co. Sligo to the west. It is located in the Barony of Dromahaire, parish of Drumlease of the province of Connaught (fig. 1). The study area encompasses the townlands of Leean, Fawnarry, Conray and Curraghan and comprises c. 600 acres of commonage, solely used for rough grazing. Figure 1: Location of Leean Mountain study area. Most of the underlying geology is well drained limestone pasture with some level of karst development in the form of protruding limestone bedrock. 10% of the area is bog-covered, including some deep deposits of untouched blanket bog in the valleys, however, the majority of the Leean valley shows evidence of prolonged and continuing peat cutting. While the uplands are primarily barren or covered by heavily eroded soils and peats, the valleys display a stratigraphy of various glacial deposits overlain by a thin layer of palaeosoils of varying age that also contain lithic artefacts (Hunt, unpublished). 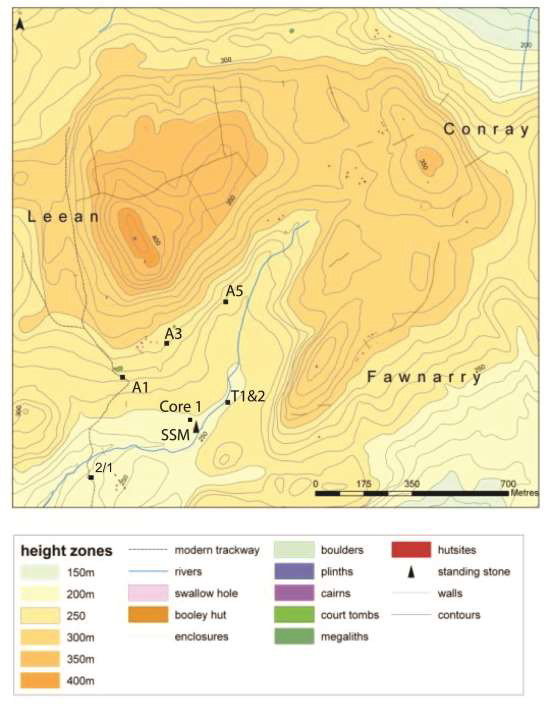 37 hut sites were recorded in the Leean area, most of which are oval in shape but slab-built rectangular and round hut sites also occur. The hut-sites occur in seven distinct clusters (A-G) of three to six huts and six isolated singular huts. Three of the clusters are situated in or near a small stream that springs from the northern top of a horseshoe-shaped valley formed by Leean Mountain and the hills of Conray and Fawnarry. 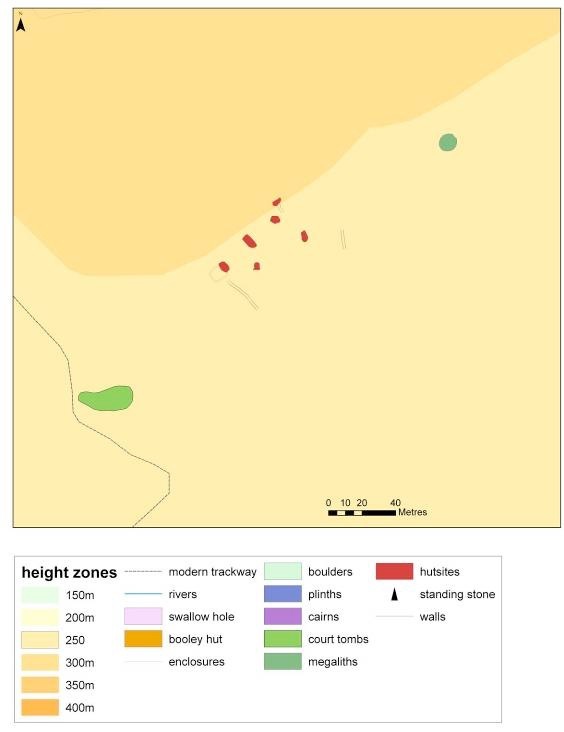 The singular hut sites are located either high on the mountains or on the periphery of the area (Kytmannow et al., 2008a) (fig. 2). Figure 2: Map of Leean Mountain and all recorded monuments. Large boulders delimit most of the circular stone-built hut sites with a gap at one side, possibly an entrance. In some instances, the sites are soil-covered with only the tips of the underlying stone foundations penetrating the grass sods. Where the huts sites are more exposed, the structure either consists of rounded boulders or slabs. 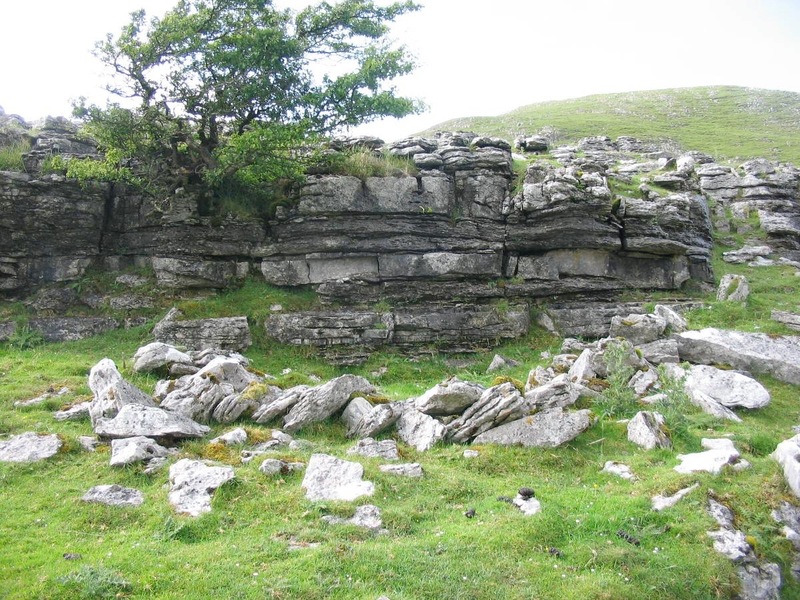 Rectangular hut sites are more frequently constructed of slabs than boulders and the majority are located in areas of exposed karst. Three of these slab-built rectangular hut sites are divided internally (fig. 3). 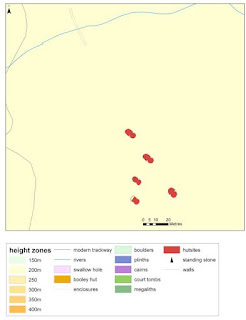 The oval hut sites (fig. 27) survive as low earth-works, some of which feature entrance stones. 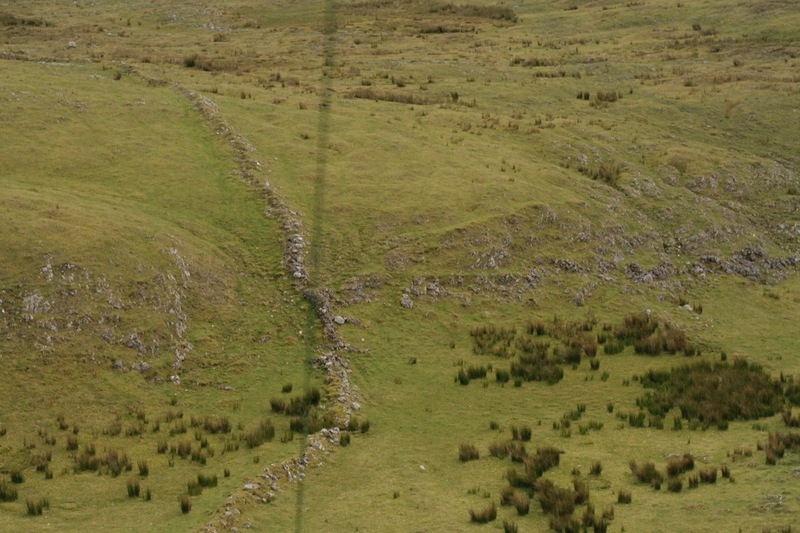 Figure 3: Rectangular slab-built hut site with two internal divisions on top of Leean Mountain. Some sites are partly covered by peat and they relate closely to pre-bog walls, which suggests that at least some of them could be prehistoric in date (fig. 4). However, there are several slab-built rectangular hut sites, which could be of considerably later, date (fig. 5), possibly relating to later farming activity. 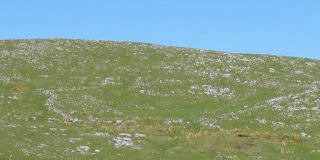 The area is still intensely used for grazing and the existence of ruined booley huts (fig. 6) and other recent structures suggest a long and continuing tradition of transhumance on Leean Mountain. 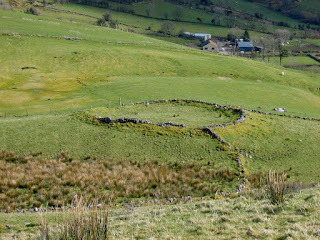 This activity is possibly connected to ringforts in the lower lands that are scattered around Leean and which are imbedded in medieval field systems (fig. 7, fig. 8). The distance and height difference from the south is so small that booleying would not have been a necessity. In contrast, the way up to Cluster G from Glencar Valley is extremely steep, covering a height difference of 200m to 300m. 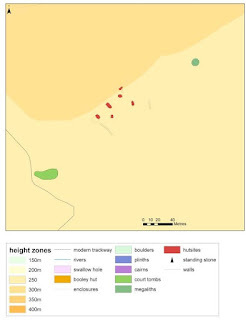 This suggests that the ringforts to the north may have been part of booleying activities connected to some of the hut sites. 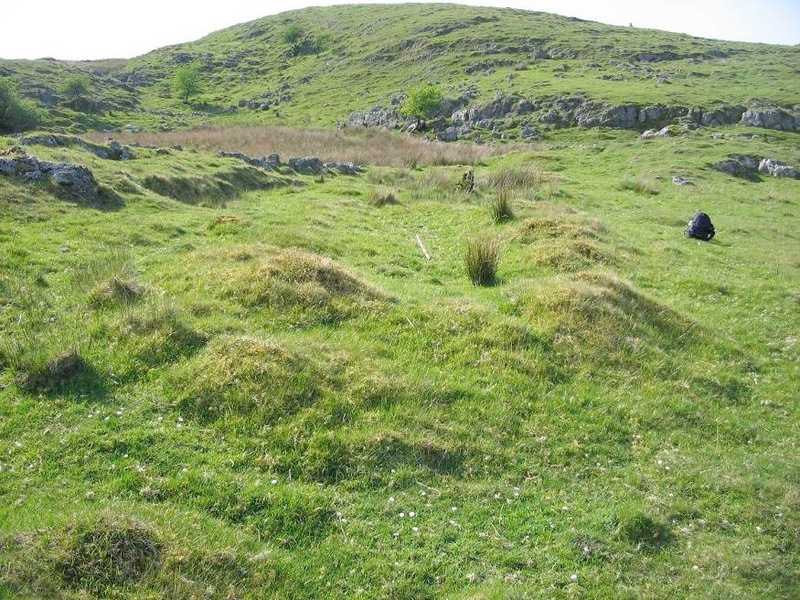 Figure 4: Round singular hut site on Conray hill, partially embedded in peat and abutting to the internal face of a large round enclosure. 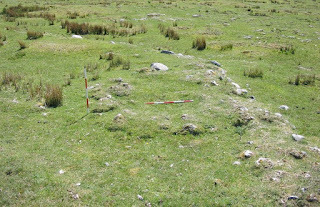 Figure 5: Round slab-built hut site 6 in Cluster C.
Figure 6: Booley hut near Cluster G.
Figure 7: Cashel south of Fawnarry. Figure 8: Cashel northwest of Leean. A possibly prehistoric enclosure is located c. 280m southwest of Cluster E. A single hut was built right up against its inner wall (fig. 9). An extensive and most likely pre-bog field wall runs through Cluster E in a northwest direction (fig. 10). A small D-shaped dry stone enclosure was built against its northern face while a possible cairn was built against its southern face (fig. 11). Another, more recent dry-stone enclosure is located east of Cluster E. It stands about 1m tall and its fabric is completely free of overgrowth. 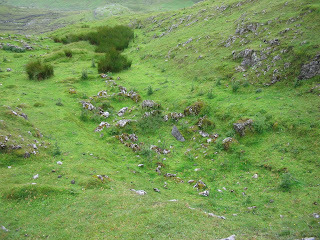 Figure 9: Possible prehistoric enclosure with internal hut site. Figure 10: Partially exposed pre-bog wall running through Cluster E.
Figure 11: Small D-shaped enclosure built against an ancient field wall. 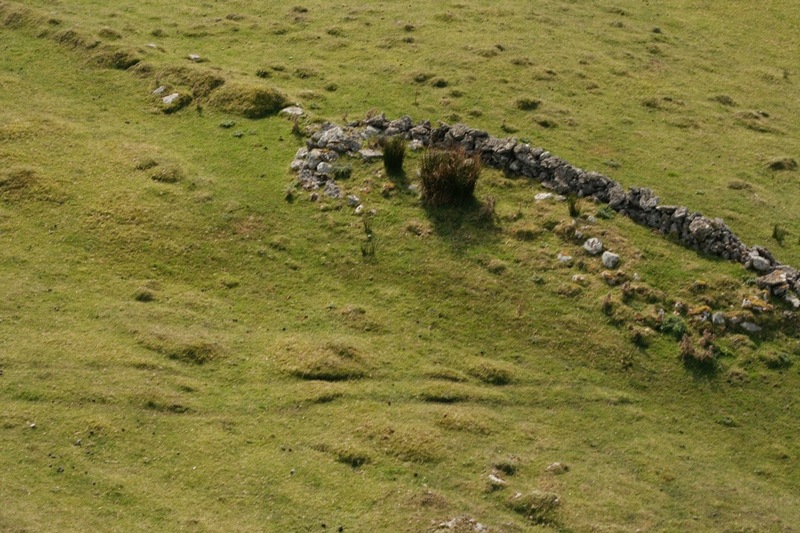 Most of the hut sites are oval in shape and orientated due north. The building material is most likely local limestone as can be seen in less overgrown hut sites. Due to heavy bog formation, especially on the inside of the huts the profile height for the Cluster E huts does not exceed 20cm. This is also the case for the majority of the more overgrown huts. 5 environmental samples were taken to establish the vegetation history of the area (fig. 12). One core was extracted above a lithic scatter beside a wall structure and below a probable court tomb. 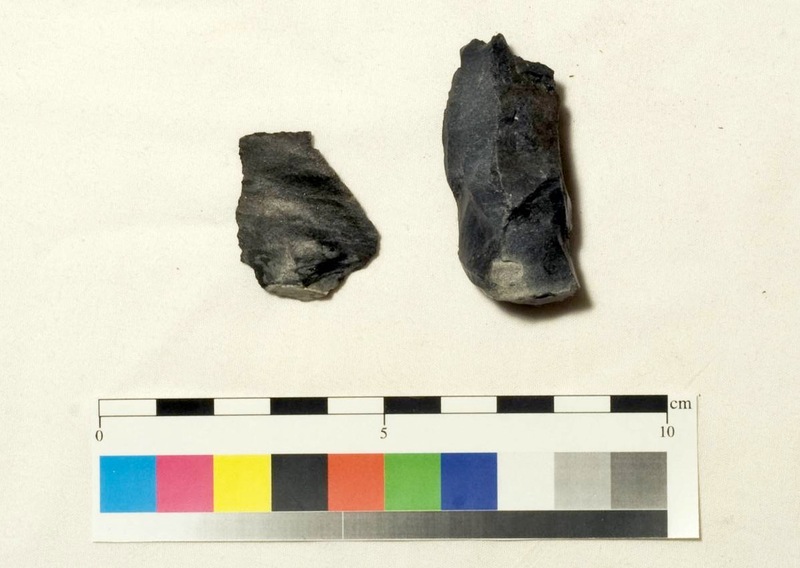 A second one was taken from buried soil below a spread of worked chert. Both cores indicate the presence of a landscape controlled by systematic burning to produce almost monospecific heather moorland. This would give a spring/early summer flush of grazing so it is possible that seasonal activity was taking place. Pine (Pinus), oak (Quercus) and alder (Alnus) have also been detected, though not in a vast abundance, they may have provided building material for huts and other structures. Core A1 also contained chipped and flaked chert in the lowest stratum. Figure 12: Locations of environmental samples. 13 AMS dates from seven different sites (fig. 12) were obtained from organic material from the environmental samples ranging from the Early Bronze Age to the Post Medieval, with a concentration of activity around the Middle Bronze age and the Medieval. The oldest date came from site T1 (fig. 12) providing a Late Neolithic to Early Bronze Age horizon (2055-1896 cal. BC 2σ) (Hunt, unpublished) but with no clear evidence of contemporaneous human activity. The sampled material was barren of cereal pollen but with some evidence of burning, suggesting the introduction of pastoral agriculture to Leean. The remaining cores also painted a picture of pastoral land use with frequent fire clearing to encourage flushes of new growth of grass. Cereal cultivation, if at all, happened only sporadically during the Middle Bronze Age (Hunt, unpublished). Accumulations of worked chert of varying quality have been found in the vicinity of the standing stone and the associated possible settlement, mostly consisting of a mixture of grey and black chert. The assemblage consists of four cores/ core fragments, 17 flakes and blades and six pieces of debitage. While most of the lithics are of indeterminate age, a bipolar core, two bipolar flakes and one pressure flake most likely date to the Bronze Age (fig. 13). Figure 13: Flake and bi-polar core, black chert. 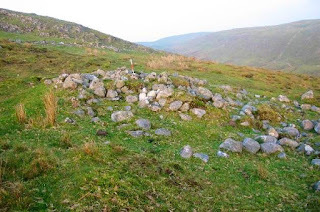 Seven cairns were recorded in the study area, five of them located on the tops of surrounding hills and two in the vicinity of hut site clusters B and G. A trig station was incorporated on a cairn on the summit of Leean (fig. 14), whereas others survive as small, mostly grass-covered mounds. Lack of dating evidence and the mostly isolated location of these cairns leaves their date indeterminable. The two cairns near the hut sites, however, suggests contemporaneous use. By association, it can be argued that at least some of the remaining cairns might also be contemporaneous with the hut sites. 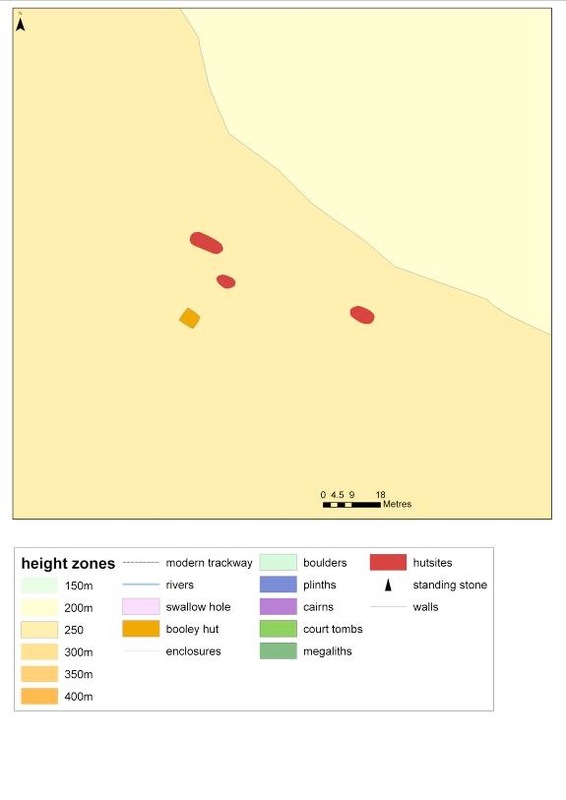 Three listed megalithic monuments, one probable court tomb (fig. 15) and two unclassified megalithic tombs, are located in the study area with the former being the most tangible evidence for human activity prior to the Bronze Age. A megalithic tomb near cluster C is probably a wedge tomb (fig. 16). 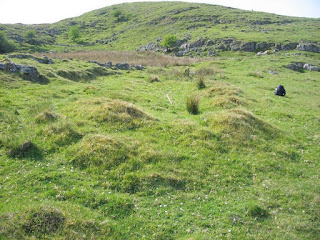 It has been described as a sub-circular cairn measuring 7.5m x 6.5m containing a central collapsed cist measuring 2.6m x 2.4m (Moore 2003, 9). Wedge tombs date to the early Bronze Age, which suggests that this monument is connected to the Bronze Age agricultural activity that was visible from the environmental samples. 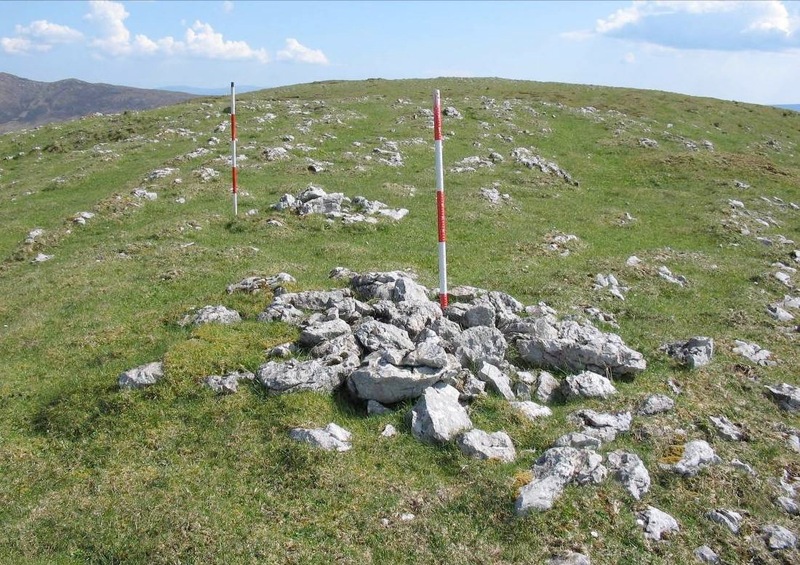 Figure 14: Leean summit with trig station incorporated into a cairn. Figure 15: Probable court tomb at the foot of Leean Mountain. Figure 16: Partially collapsed cist inside an unclassified megalithic tomb. 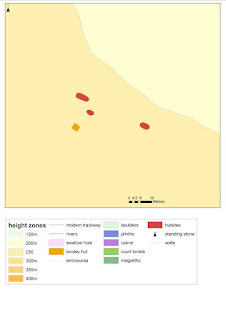 A second unclassified megalithic tomb occurs as an isolated site at Conray and contains at least one cist and is probably an undifferentiated passage tomb or a wedge tomb (Moore 2003) (fig. 17). 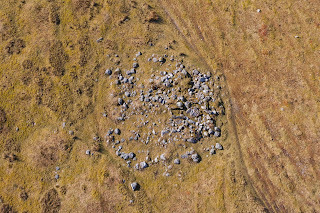 Figure 17: Megalithic tomb near Cluster F.
A large boulder circle is located in close vicinity to Cluster B and contains a small cairn (fig. 18). It consists of 5 large glacial erratics, four of them resting on plinths. The boulder circle is discussed in the following section. Figure 18: Boulder circle and cairn near Cluster B. The area of Cluster C features a mixture of ritual and secular structures (fig. 19), which is only paralleled by Cluster B. Six hut sites are located in close proximity to a cairn containing a cist, and a probable court tomb. Above the site is a knapping floor and below a possible chert quarrying site. 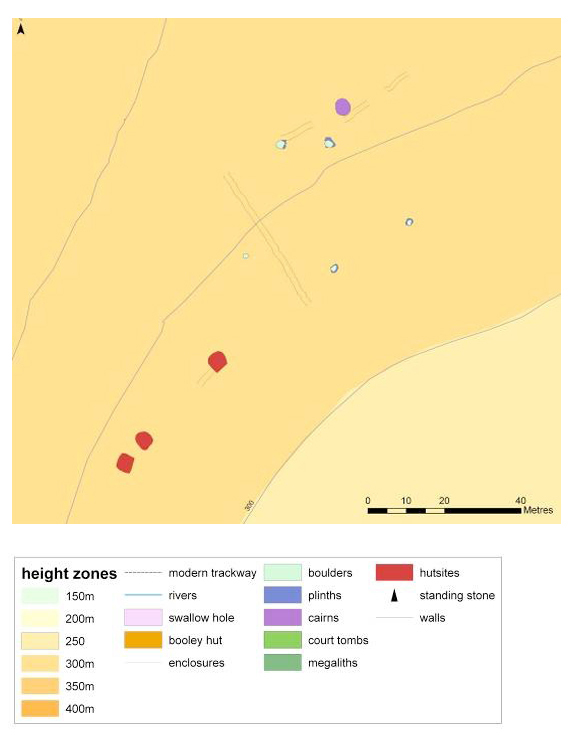 The construction of the hut sites differs somewhat from the others as they are dominated by the rectangular construction type with only one round and one oval example. Furthermore, all huts are constructed of limestone slabs as opposed to the more common boulder or earthen built sites (fig. 5). One of the sites is built next to a small sub-rectangular enclosure. It is possible that this cluster is related to activities that took place around the two megalithic monuments rather than being used for agricultural purposes. 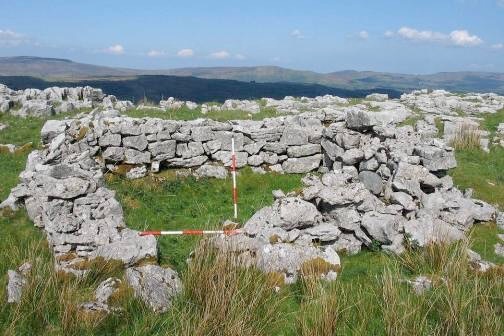 A similar close relationship between hut sites and megalithic monuments has also been observed on Knocknarea Mountain, Mullaghfarna and Knocknashee, all in Co. Sligo and on Turlough Hill, Co. Clare (Bergh 2000, 2015; Condit and Gibbons, 1991). 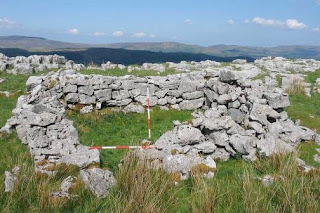 Despite the choice of limestone slabs instead of boulders or soil as the main building materials, the hut sites do not differ substantially in size or construction from the other two types. The foundations of all three types would have held posts in place that supported the hut’s superstructure. The rectangular shape of four of the huts could be explained by the use of rectangular slabs. The most western hut is incorporated into a small irregularly shaped enclosure and it is located in close proximity to an ancient field wall section. Another field wall section, c. 5m long seems to be emerging from the most northern hut site of this cluster. It is hard to tell how the two are related without a secure chronology. Figure 19: Cluster C and associated features. Two further hut sites are located north and northwest of Cluster C and at the southern slope of Leean Mountain. The northern hut is situated on the summit of the mountain about 100m away from the cairn. This hut site is a more complex example, roughly rectangular in shape and divided into three equally sized sections. It is located in a depression, opening to the west (fig. 20). A small standing stone (fig. 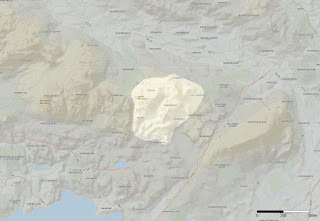 21) is located c. 350m south of the cluster and is possibly of Bronze Age date. 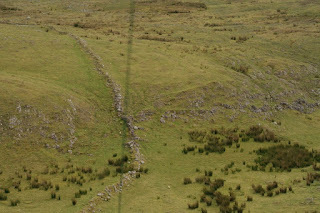 Figure 20: Rectangular tripartite hut site (bottom left corner) near the summit of Leean. Figure 21: A small standing stone near the stream that flows through the study area. A cairn with a possible satellite is located at contour 340m northwest of the summit of Conray hill and c. 100m east of Cluster F (fig. 22). Cluster F itself consists of five oval hut sites, almost entirely covered in bog and vegetation. Three ancient wall sections are located west, south and southeast of the cluster. 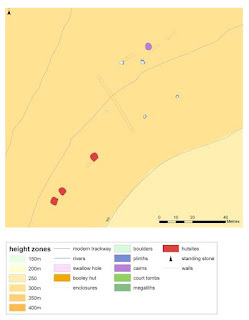 None of these features are close enough to the cluster to indicate a direct connection between them but it cannot be ruled out as all but one cluster of hut sites stand in relation to megalithic structures, cairns or field walls. 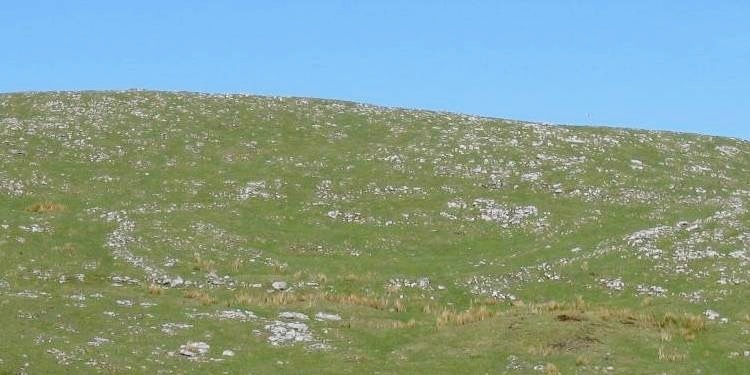 Figure 22: Two cairns near the top of Conray hill. Cluster B consists of three sub-circular hut sites (fig. 23). 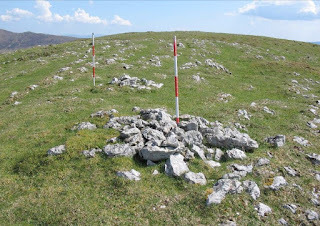 Similar to cluster C, a cairn is located only c. 100m from the cluster and to the northeast (fig. 24). Between the huts and the cairn is a remarkable boulder circle measuring c. 40m in diameter and consisting of 5 massive boulders. These boulders are resting on natural limestone plinths (fig. 25). Two of the boulders seem to have been originated from the same boulder because they are such a well matched pair but a closer investigation revealed that they are not from the same split stone. However, one of the plinths has been most likely substantially enlarged by human agency, from a natural height of c. 0.5m to c. 1.5m. 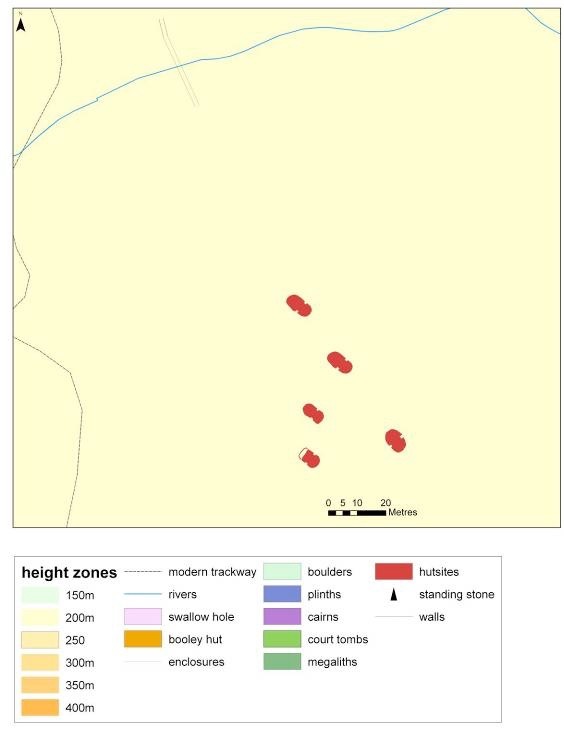 This discovery is especially interesting when seen in the wider context; recent research in the Burren region, Co. Cavan, about 20 km from Leean, has identified a large number of pedestal rocks which have been modified using lithic technology (Kytmannow et al. 2008b), changing natural places into monuments. Figure 23: Cluster C and associated features. Figure 24: Cairn east of Cluster C.
Figure 25: One of the five massive boulders forming the boulder circle near Cluster B. Cluster G is located on the north side of Conray (fig. 26). 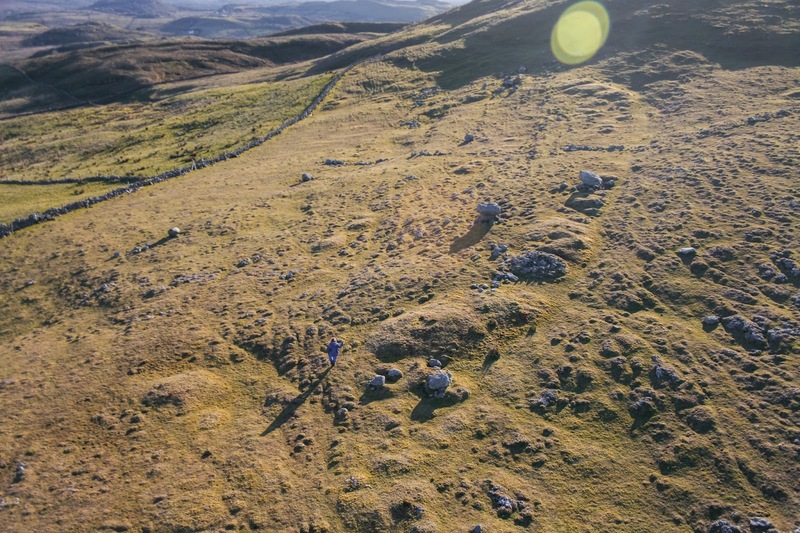 It is the furthest to the northeast and consists of three oval earthen hut sites, one modern booley hut and two modified caves, the latter were possibly used as small stables or for storage. 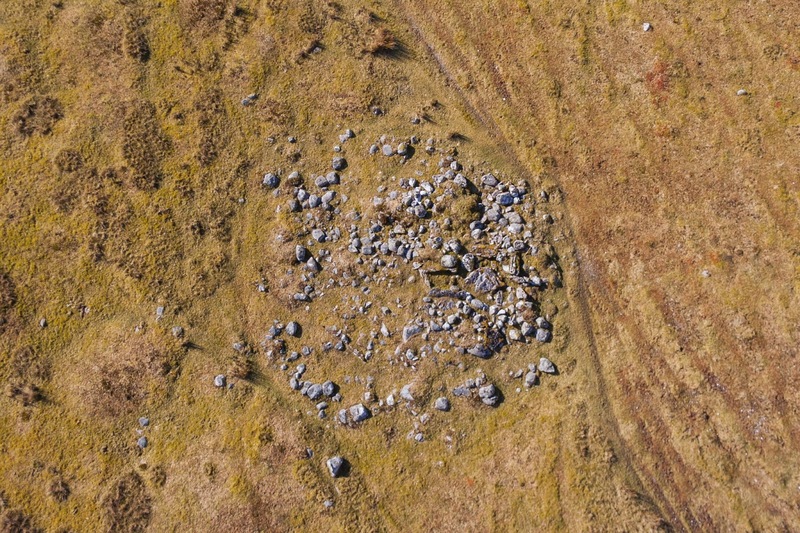 A large round cairn with kerbstones, a central chamber and a secondary cist are located c. 85m to the west. 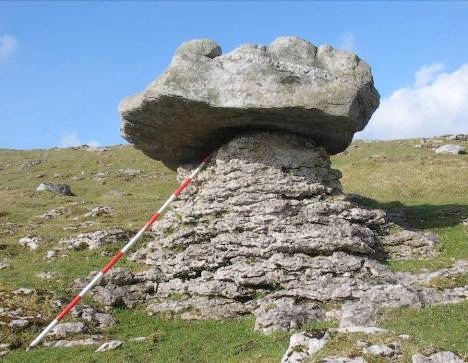 Moore (2003, 5) suggests that this structure might be a ruined wedge tomb, but Kytmannow et al. (2007) argues that these are the remains of an undifferentiated passage tomb. The location of Cluster G is remarkably different. High above a very steep slope and with only a couple of hours sunlight in winter Cluster G is a very good candidate for seasonal transhumance, a tradition which is certified for the modern time by the presence of the booley hut. Figure 26: Cluster G and associated features. 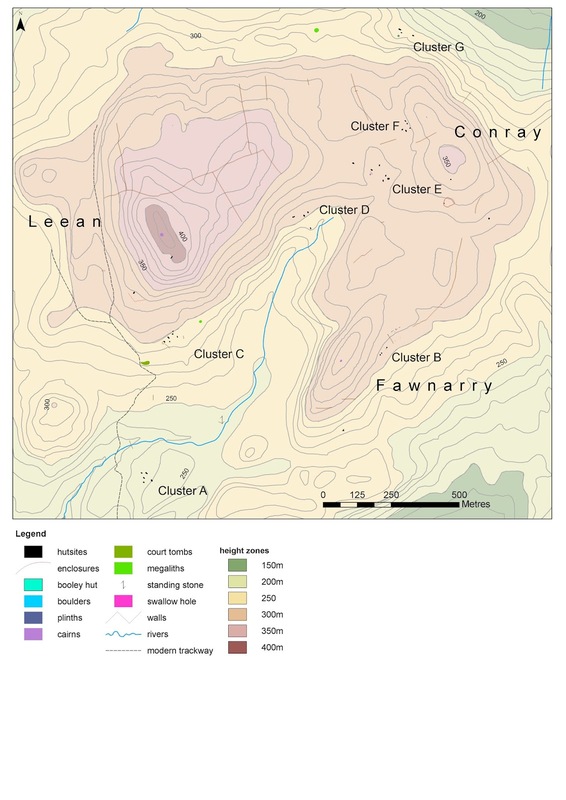 Cluster A is the only cluster of hut sites that is not associated with a cairn or megalith. While the hut sites have a superficial similarity with the other earthen oval huts, there are noticeable differences. The walls of the huts are more substantial and built of clay and small boulders. They have clearly two entrances opposite each other, one of them delineated by upright stones. They appear to be better preserved, and possibly are of later date, perhaps Post Medieval. 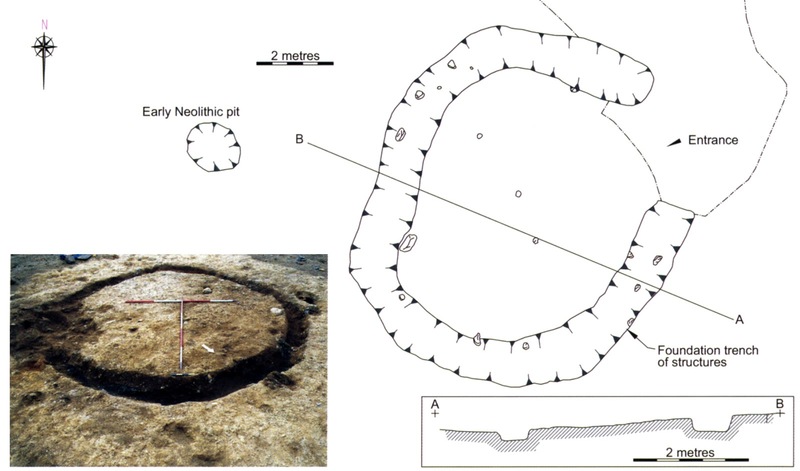 Circular huts have been used from the Neolithic into the Early Medieval times (Smyth 2014, Moore 1995, 225) and it is almost impossible to establish a detailed chronology without excavation. The low profile of the overgrown remains sometimes makes them indistinguishable from the rough terrain and even during surveying new hut sites were identified while others turned out to be natural. Figure 27: Earthen hut site at Cluster G.
Moore’s thorough investigation of a Bronze Age settlement in the Monavullagh Mountains, Co. Waterford reaches a similar conclusion (ibid., 225). It is worth mentioning Monavullagh as many parallels can be drawn between it and Leean Mountain. Just like Leean, Monavullagh is an upland settlement located in a U-shaped valley with huts mostly located along a stream. What makes the two sites different is that in the case of Monavullagh there appears to be a clear separation between the sacred and the secular with only some exceptions (ibid. 199). Leean also differs from Monavullagh as the latter features a much wider range of monuments. Fulachta fiadh, the most common Bronze Age monuments, barrows, double stone alignments and pairs of standing stones, all absent at Leean have been identified at Monavullagh and form a complex settlement with extensive ritual activity (ibid. 193-4 and 238). 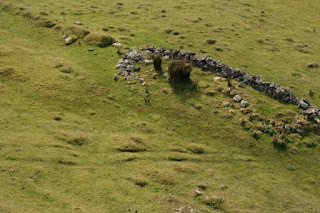 Figure 28: Booley hut at Cluster G.
The hut sites at Leean resemble those at Monavullagh in size and shape, though morphologically the Leean hut sites seem to feature a bigger variety of shapes, ranging from circular, sub-circular, oval, sub-rectangular to rectangular. Internal divisions, where present, also seem to be more pronounced than at Monavullagh. However, Monavullagh features some larger huts, probably used as community houses (Moore 1995, 197). Figure 29: Cluster A and associated features. Only one standing stone has been identified at Leean, close to the stream and standing only 1m tall. The 11 standing stones at Monavullagh stand up to 2m tall, are highly visible in the landscape and are believed to have played a significant role in the ritual organisation of the landscape (ibid. 199). This cannot be said for the standing stone at Leean, its purpose remains undetermined. Figure 30: Hutsite, Cluster C, with possible entrance features. The possibility of a presence of a Neolithic monument at Leean in the form of a court tomb is also an enigma as it appears to be the only trace of Neolithic activity at Leean. Moore (ibid. 225) suggests for his hut sites that wooden huts may have predated the stone foundation ones leaving no visible trace above ground. This could also be the case at Leean, although the dates obtained from the pollen cores and monoliths show a distinct paucity of Neolithic activity. 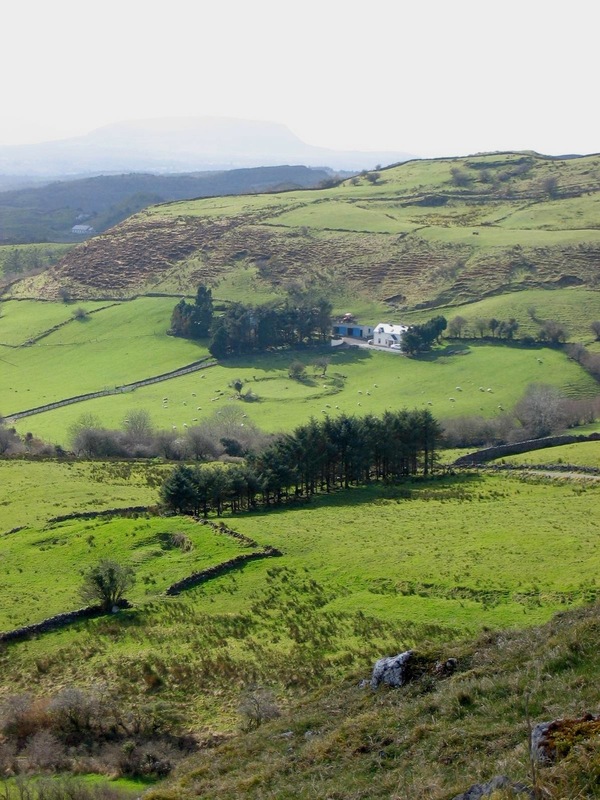 The Late Bronze Age/ Iron Age dates are of particular interest as only very few evidence for Iron Age settlement is known in the Sligo/ Leitrim area. For example, an Iron Age hut discovered by Danaher, was excavated at Magheraboy (2007, 135-6) (fig. 31) and Fredengren (2000) discovered Iron Age activity at a crannog at Lough Gara. 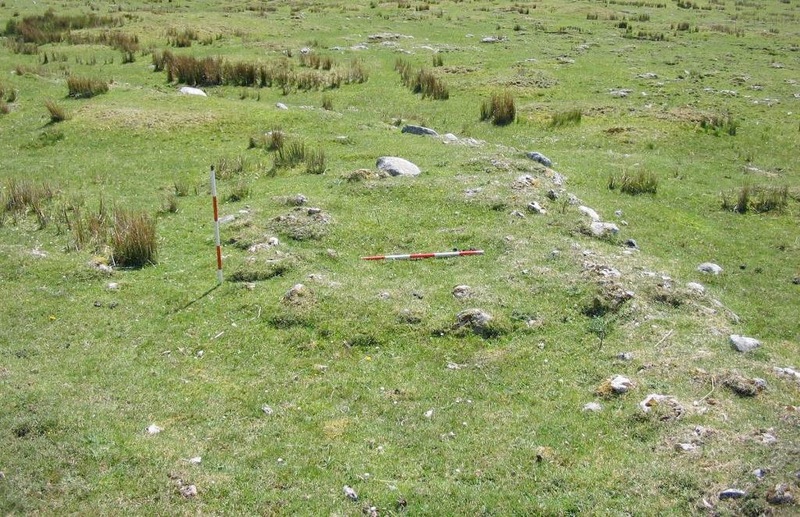 Figure 31: Iron age site at Magheraboy (Danaher 2007, 135). 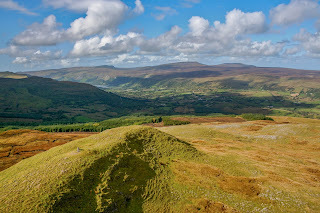 The upland area of Leean mountain is a unique area, which has great potential to allow deep insights into the some of the dark spots of Irish prehistory. Beaker and Iron Age settlements are still very enigmatic and further more detailed investigation, including excavation of at least some of the sites will hopefully shed more light to help fill some of the gaps of Irish prehistory. Bergh, S. 2000 Transforming Knocknarea: the archaeology of a mountain. Archaeology Ireland 14 (2), 14-8. — 2015 Where worlds meet. 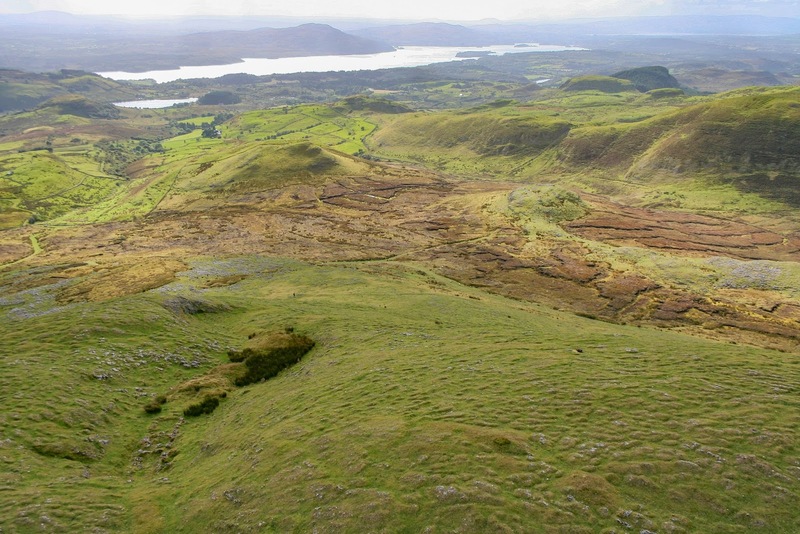 Two Irish prehistoric mountain-top 'villages'. Il Capitale Culturale 12, 21-44. 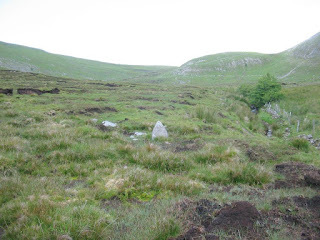 Clarke, S. and Kytmannow, T. 2004 The Leean Mountain area of County Leitrim. Archaeology Ireland. 18 (22) 36-39. Condit, T. & Gibbons, M. 1991 A glimpse of Sligo's prehistory. Archaeology Ireland 5 (3), 7-10. Danaher, E. 2007 Monumental Beginnings: The Archaeology of the N4 Sligo Inner Relief Road. NRA. Fredengren, C. 2000 Iron Age Crannog in Lough Gara. Archaeology Ireland 52, 14 (2) 26-28. Hunt, C. Palynological studies at Leean Mountain, Co. Leitrim. Unpublished. Kytmannow, T., Mallory, J. and Trick, S. 2008a Leean Mountain Prehistoric Landscape Survey. online: http://www.qub.ac.uk/sites/Leean. accessed Nov. 2008. 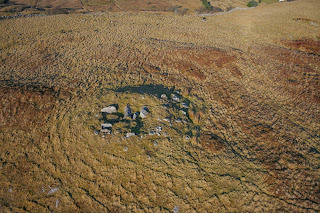 Kytmannow, T., Mens, E., Gunn, J. and Kerdivel, G. 2008b “Creating Sacred and Secular Space” A study of the glacial erratics and early human settlements in the Cavan Burren landscape. Unpublished report to the Heritage Council. Kytmannow, T., Hunt, C., Gunn, J. and Kahlert, T. 2009 Leean Mountain Prehistoric Landscape in Context. Final Report to the Heritage Council of Ireland. Online:http://www.qub.ac.uk/sites/Leean/FileStore/Filetoupload,416201,en.pdf. accessed 29/ 6/ 2016. 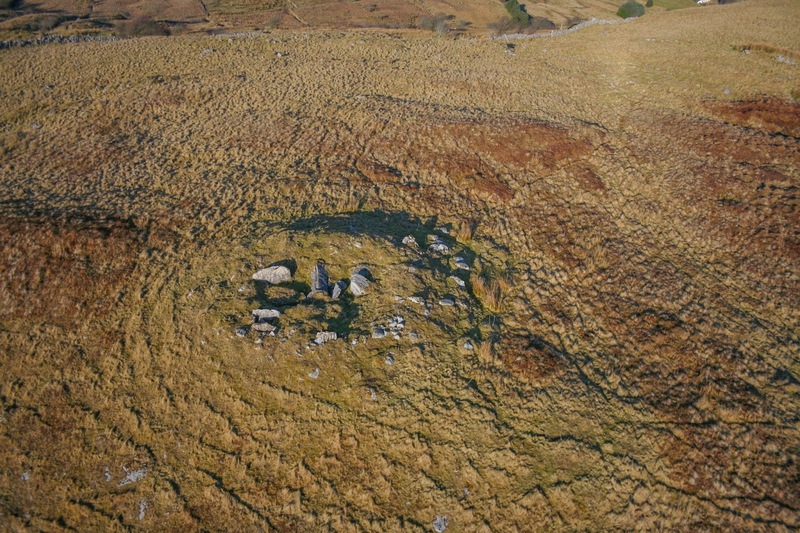 Moore, M. 1995 A Bronze Age settlement and ritual centre in the Monaghvullagh Mountains, County Waterford, Ireland. Proceedings of the Prehistoric Society. 61, 191-243. 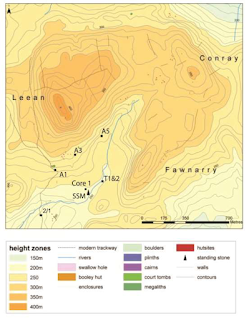 Moore, M. 2003 Archaeological inventory of County Leitrim. The Stationary Office, Dublin. Smyth, J. 2014 Settlement in the Irish Neolithic: New Discoveries at the Edge of Europe. Oxford: Oxbow. Great piece, thanks for posting. I really enjoyed this blog post. I work with farmers in the area, and it helps me understand how the past has shaped the farmland I see in 2016.